What Day Of The Week Is July 17? 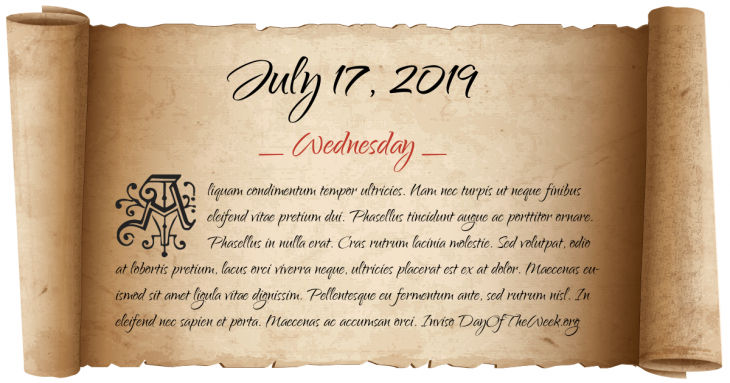 July 17, 2019 is the 198th day of the year 2019 in the Gregorian calendar. There are 167 days remaining until the end of the year. The day of the week is Wednesday. The Fourth Crusade captures Constantinople by assault. The Byzantine emperor Alexius III Angelus flees from his capital into exile. Bloody Falls Massacre: Chipewyan chief Matonabbee, travelling as the guide to Samuel Hearne on his Arctic overland journey, massacres a group of unsuspecting Inuit. King George V of the United Kingdom issues a Proclamation stating that the male line descendants of the British royal family will bear the surname Windsor. On the orders of the Bolshevik Party carried out by Cheka, Tsar Nicholas II of Russia and his immediate family and retainers are murdered at the Ipatiev House in Ekaterinburg, Russia. History of East Timor: East Timor is annexed, and becomes the 27th province of Indonesia. The opening of the Humber Bridge by HM The Queen in England. A diplomatic conference adopts the Rome Statute of the International Criminal Court, establishing a permanent international court to prosecute individuals for genocide, crime against humanity, war crimes, and the crime of aggression. Who were born on July 17?